I love my son (he is my boy, after all), but I have to admit that when it comes to hiking, he�s completely useless. His form is sloppy, he has absolutely no stamina, and when it comes to carrying a pack? Forget it. As parents, we don�t want to push our kids too much, but I think we�ll make a hiker of him someday. (I mean, he�s only been walking for a little over eight months, for Pete�s sake. He�ll get better, right?) 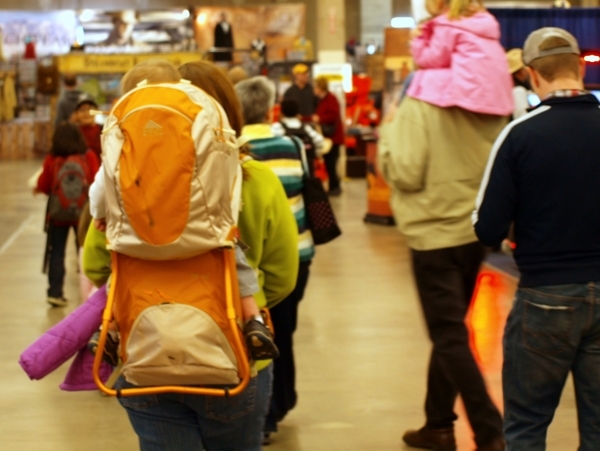 Until then we rely on our child carrier a lot�when we take the family hiking or geocaching or just to the mall. With our first kid, the girl, we found a cheap carrier at a mom-to-mom sale. It lasted about a month or two before it was replaced by another used carrier given to us by a friend. Both were adequate, but neither all that comfortable. Both parent and child came away from the experience less than satisfied. With this in mind, we were excited to try the new FC 3.0 Child Carrier from Kelty. We first tested this pack on a trip to Colorado, and used that experience to review the carrier on another site. But since then we have used it for hiking and camping, geocaching, going to festivals, and everyday use, and I wanted to share an update with readers here. This pack has a ton of features�a changing pad, a mess of straps and padded harnesses, a flip out stand for easy loading, and plenty of storage. All these extras made the pack a little heavier than what we�re used to, but the numerous adjustments allowed us to find the perfect fit, something we weren�t used to at all. There�s a learning curve when using the FC 3.0 Child Carrier, and I would strongly recommend reading the documentation before tossing a kid on your back. We made two short trips before realizing the boy didn�t have to be towering over the head of his parental porter. With two small adjustments, the seat was lowered, and from then on he had a gay ol� time yanking his mom�s ponytail. Loaded up with diapers, bottles, snacks, and a 25-pound toddler, it�s not ideal for eight hours of rough walking. In fact, it would be a great way to start training for the Appalachian Trail. But for day hikes and roaming around the mall, we�ll be using this one until the youngest outgrows it. "I still find each day too short for all the thoughts I want to think, all the walks I want to take, all the books I want to read, and all the friends I want to see." Our Days Are Just Filled powered by WordPress and Specky Geek.